There is a certain peace that comes over you when you look around your home and think to yourself ” I am ready for the holiday season”. This,of course, comes after hauling around the boxes in the basement, weeding out the things you can’t believe you saved, fussing at your Hero about stocking positions and panicking over the missing shepherd in one of the many Nativities you own. Add a curious Princess who just wants to “help Mama” as she dismantles and rehangs all the ornaments on the lower third of the Christmas tree and the joy of the season can evaporate quicker than a bottle of peppermint essential oil with the cap left ajar. But we survived and yes,I think we are ready for blessed Yuletide. Step into my living room! The Princess has graduated to open pocket doors! The room seems bigger and not as crowded…almost. Oh how I love a pretty mantel. Especially when it features some of my favorite Santas collected from, well, everywhere. 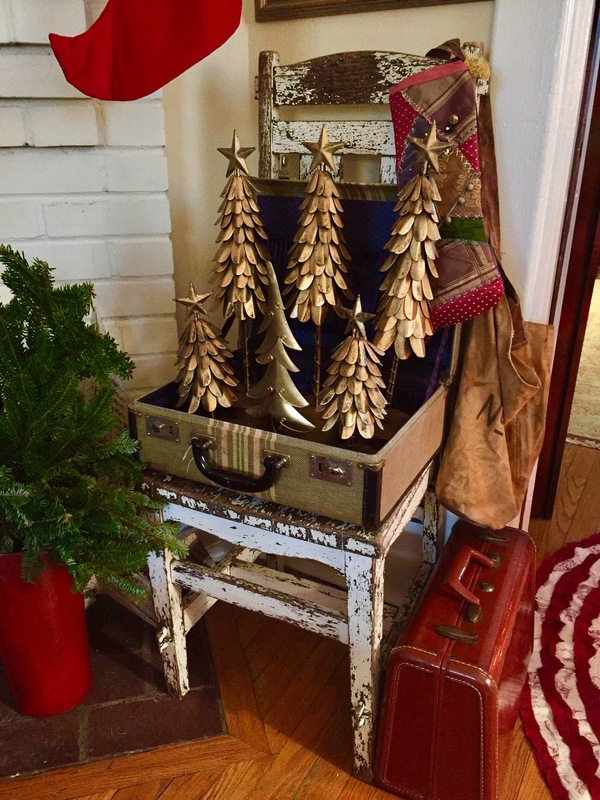 A vintage suitcase filled with gold trees…why not! I was gifted this beautiful red and white enamelware pan, the perfect place for my Grandmother’s little church and Polish pottery trees. The nativities are from adventures in Japan and India. 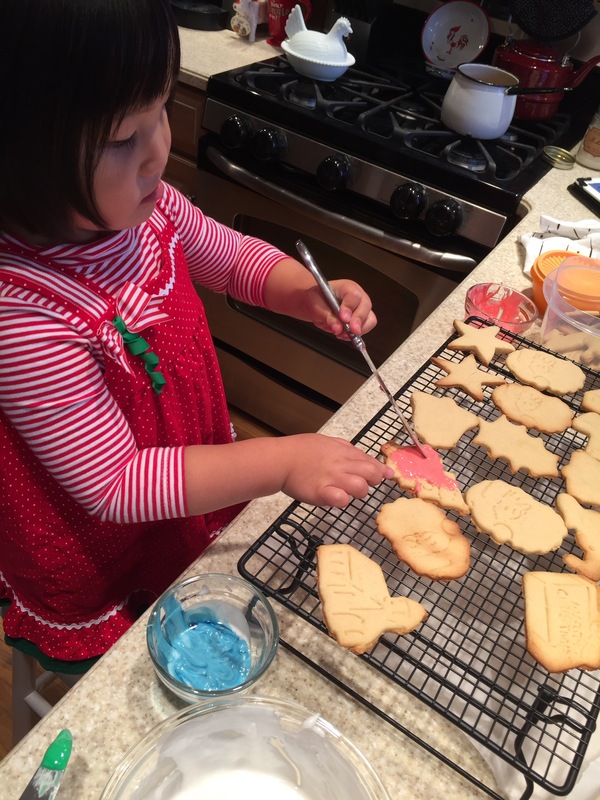 The artist at work creating that perfect Christmas cookie! How are you celebrating the season? Too cute! Looks beautiful ! Of course she is frosting with pink icing! Ha! Cute dress! 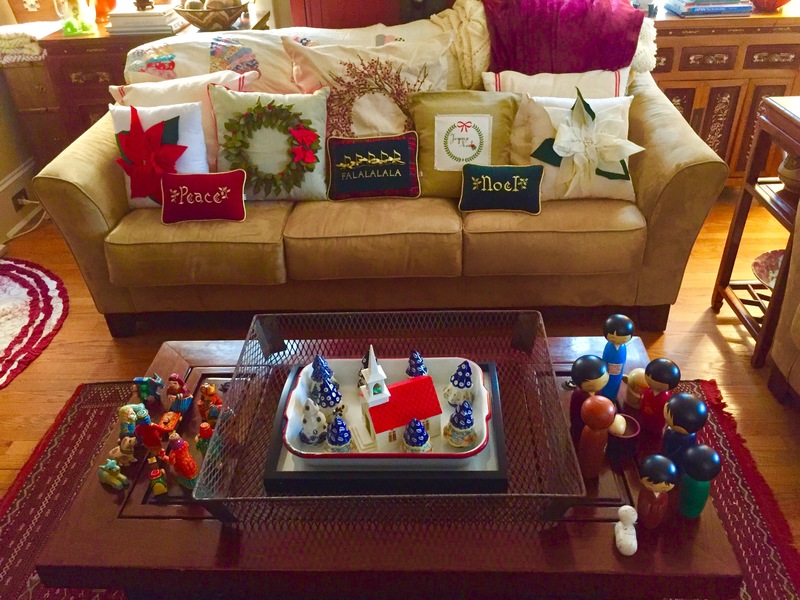 My but you do have the Christmas goodies and have used them to create a warm and friendly room. Beautiful! You are definitely ready for Christmas. 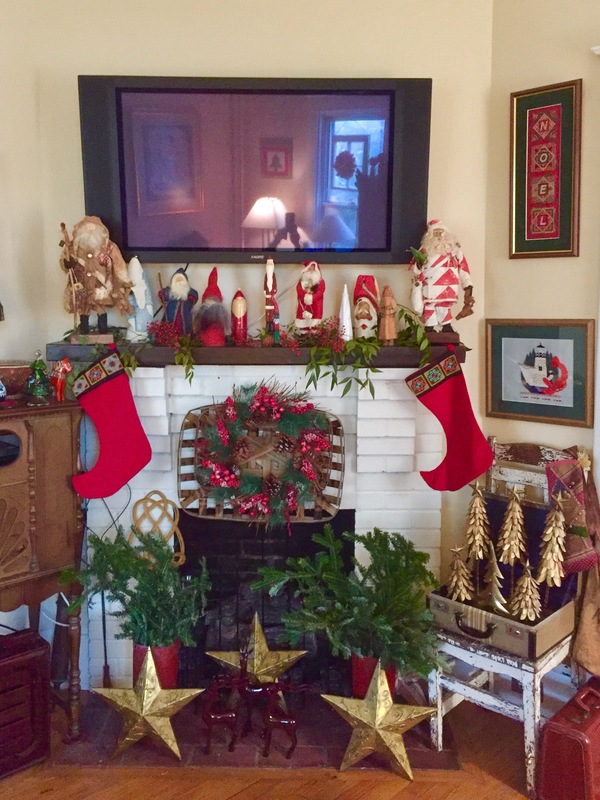 I am mesmerized with all of the Santas on the mantel and would love a close-up photo or maybe just a few per photo to see their individual characteristics. I love them! The Princess is a helpful “elf” for you and an adorable one too! Thank-you for sharing your home and Family. There will be an entire blog entry dedicated to my beloved Santas tomorrow. They still mesmerize me when I open the box each year! Everything is beautiful, including your little girl!! Me too…but I also liked the church. I was so happy my mom gave them to us this year, although the cookies seemed bigger when I was little. Love your Santas and the use of the vintage suitcase — clever. The Princess is just too cute decorating cookies. Joy Joy Joy! I too love it when the decorating is done and now we can enjoy the spirit that it bring into our home. My girls and I will have a baking day on the 22nd and that is always so fun! Great Santa collection and I love the suitcase filled with trees! Thanks for sharing with SYC. Your little one is such a cutie! I smile every time I see her photo in your banner. Yes, all ready here, and it is such a great feeling. Now we can relax and enjoy the season with family and friends. What a sweet little princess you have! Enjoy your holidays and thanks for linking up to Funtastic Friday! Hi! I gave you a feature today on “Let’s Talk Vintage!” I’m having trouble loading images and hope to fix it very soon! Thank you for linking up! Thank you! So excited and honored! Thank you. There is a fine line between cozy and cluttered. I hope I stay true on that line! 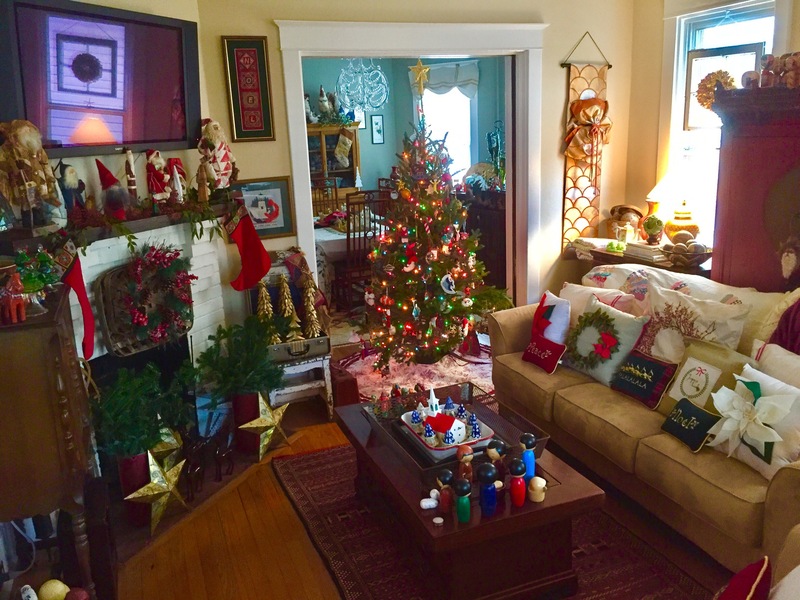 What a warm and cozy Christmas home! Love your Santas and especially the picture of your daughter decorating the cookies. Thank you for joining Monday Social. Thank you. She is our joy. Christmas is so much fun with her with us! Have a wonderful Holiday season! Thanks for sharing at Home Sweet Home!